Power-Ups (another cool word for "add-ons") extend the functionality of Jibble to meet the needs of different companies. For example, a company may need to report on time spent by their staff on various activities/projects and others want to bill their time to Clients. However, not all companies want to do this, which is why these power-ups are not available by default. Access to power-ups requires a subscription to a Power-Plan. For new teams there is a 14 day free trial to try them out. Integrations are 3rd party applications (for example Slack) that work with Jibble. These are completely free to use, regardless of your plan. Activity Tracking - enables companies to record time against projects or department activities. Client Billing - enables time to be associated with Clients, for invoicing purposes. Collaboration - setup your team with different roles to enable or disable access to data and features of Jibble. Policies - configure how jibble will be used by your team. You can enforce (or prevent) usage of specific channels and set which data is accessible/available. 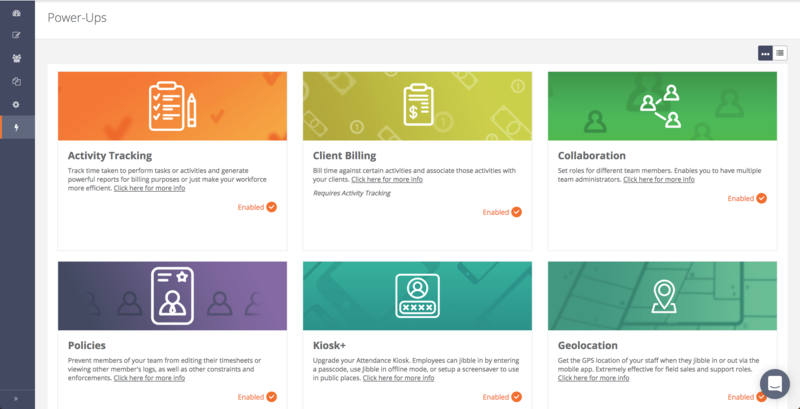 Kiosk+ - extend the functionality of your Attendance Management Kiosk. When enabled, you can require your staff to Jibble In/Out with a passcode, or use the Kiosk in offline mode when there is no internet access available. Geolocation - with Geolocation, your staff can Jibble In/Out with the GPS location from their phone. You will have access to detailed reports with locations. Facial Recognition - a great security measure to prevent "buddy punching". Your staff Jibbles In/Out, whenever there is a face mismatch (a suspicious entry) you will receive an e-mail! Track your time and attendance more efficiently by integrating the Jibble bot with your tools such as Slack and Microsoft Teams. Find out more about Integrations here.